Continuing his drumbeat messaging campaign on immigration just days before the midterm elections, President Donald Trump, in remarks at the White House Thursday, announced what he described would be a change to rules to crack down on asylum seekers, suggesting without providing evidence that many migrants seek and receive asylum illegitimately. Under current law, immigrants may apply for asylum regardless of how they enter the country. Trump’s said his order would require them to apply at a port of entry. Refugees International said in reaction that the president's plan to consider asylum seekers entering only at legal ports of entry is illegal under a United Nations treaty that the U.S. ratified, which says applicants entering illegally should not be penalized if they present themselves without delay and show good cause for their illegal entry. “President Trump did not announce an immigration policy this afternoon, but repeatedly lied about the asylum system, his family separation policy, and his largely unfunded wall. If he plans at some point to prohibit people from applying for asylum between the ports of entry, that plan is illegal,” Omar Jadwat, director of the ACLU’s Immigrants’ Rights Project, said in a statement. For the first time, Trump also seemed to threaten the use of force against migrants at the border. Asked about rock throwing again, Trump responded, "We're not going to put up with that. If they want to throw rocks at our military, our military fights back. We're going to consider -- and I told them, consider it a rifle. When they throw rocks like they did at the Mexico military and police, I say, consider it a rifle." U.S. military officials have said repeatedly that the more than 7,000 active duty forces being sent to the border will serve only in a support role to Customs and Border Protection (CBP). By law, they cannot carry out law enforcement duties and are not supposed to come into contact with migrants crossing the border. 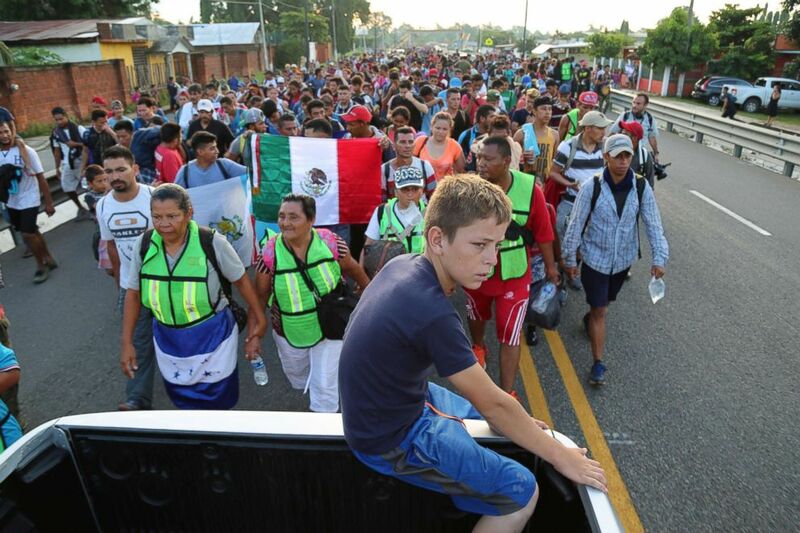 The troops will be armed and have the right to self-defense, but because they are in a support role they may not come into contact with the migrants. Military rules of engagement are typically not made public, but they are usually escalatory, with proportional responses to a variety of threats, including the use of non-lethal deterrence before a use of force can be used. He added that the active duty forces will also receive training so that their rules of engagement are compatible with CBP’s. No country can allow itself to be "overwhelmed by masses of people rushing our border," Trump said. “These are tough people in many cases,” Trump said, adding that the caravan of men, women and children is full of “young men, strong men” who are “not legitimate asylum seekers,” again providing no evidence to back up that claim. “Asylum is not a program for those living in poverty,” he said. “Asylum is a very special protection intended for those fleeing government persecution based on race, religion and other protected status." Many migrants, including from Honduras and Guatemala, have said they are fleeing gang violence after family members have been murdered or threatened. They may be able to claim that if a government doesn't protect a group of people from gang violence it could be considred state-sanctioned. Trump also repeated comments he's made in recent interviews that migrants seeking asylum will be kept in tent cities, rather than released until their cases are adjudicated in immigration court. Trump said "we're putting up massive tent cities" with "the military's help" although a defense official said Thursday that the Pentagon had received no request to set up tents for detained migrants. The president also made a number of false claims, suggesting that the Obama administration, and not the Trump administration, separated families at the border, that most asylum seekers don’t show up for their court dates, a claim debunked by PolitiFact, and that Democrats want migrants to vote and to sign them up for free health care, welfare and education, a claim also contradicted by PolitiFact. The president's remarks came just before he headed to another campaign rally as part of a pre-election blitz, this one in Columbia, Missouri, and after he has also called for ending birthright citizenship and sending thousands of additional troops to the border as a caravan of migrants makes its way toward the United States from Central America. A migrant child barely able to continue onward jumps onto a truck to rest during the caravan to Tapachula, Mexico. The president has made immigration the centerpiece of his closing argument ahead of Tuesday’s midterm election. “Republicans want strong borders, no crime, no chaos, and no caravans. Democrats want open borders, and they want to invite caravan after caravan into our country, which brings crime upon crime,” Trump said at a campaign rally in Fort Myers, Florida, on Tuesday. After denying that his heated rhetoric over immigration is fear mongering before voters head to the polls to ABC News’ Mary Bruce, the president tweeted a controversial and racially charged digital ad produced by the White House focusing on an undocumented immigrant convicted of murdering two California sheriff's deputies in 2014 to suggest there were many more like him -- and using footage of migrants trying to break down gates along the Mexican border when the caravan has been mostly peaceful. In addition to increasing the presence of U.S. Army National Guard troops on the border, the president has called for ending birthright citizenship. Trump claims birthright citizenship is not guaranteed by the 14th Amendment to the Constitution, but many legal scholars and lawmakers – including House Speaker Paul Ryan, a fellow top Republican – disagree. The president lashed out at Ryan over voicing his criticism of ending birthright citizenship. ABC News' Elizabeth McLaughlin. Luis Martinez and Conor Finnegan contributed to this report.